Scotland Stars Win Championship, And Finish The Season With 7 Consecutive Wins! Goldberg Finnegan are the proud sponsor of the Scotland Stars, a 7th-grade basketball team that plays in the Montgomery County Recreation Department basketball league. The team's record was 7-1. Of note, they won 7 straight games after losing the first game of the season. A special thank you to their incredible coaches Ben Leffler and Brandon Ferrell who did an amazing job with the kids. Not only did they teach them to work as a team, work hard, and take pride in how they play, but they also stressed the fact that the kids were student athletes and that doing well in school is as important as performing on the Basketball Court. A special thank you is also in order for Patti Goldberg, a retired Bells Mill Guidance Counselor, for helping to put this team together. The Scotland Community is located in Potomac, Maryland and it consists of about 100 townhouses off of Seven Locks Road. The lawyers at Goldberg Finnegan are committed to staying actively involved in their community, and to protecting the rights of individuals against big corporations and insurance companies. I must say that at the beginning of January I was not sure the season would have ended up the way it did. We battled through an ugly defeat, and took positives to build on throughout the season. We stole a game with a last second shot, and we then we put together a solid game to win and go 2-1. Then the blizzards of 2010 came, and we missed out on three weeks of games, but still were able to have practices. I think that was the turning point in our season. We worked hard during every practice, and the guys learned to trust one another. Then we came back after the break with a thunderous performance that saw our guys score 50 plus points. That gave us the confidence we needed for the remainder of the season. I saw a hunger in the eyes of each player that had not been there before, and then our Scotland Stars then knocked off the two best teams in the league 2 of the last 3 weeks, and because of that effort they were crowned CHAMPIONS!!!!! I am so proud of the effort that was displayed on the floor today. EVERYONE played hard, and they left everything on the floor which is all we could as for. What I loved today, even though it was hard, was how we responded to relinquishing our large lead. We were up big going into the 4th quarter, and when the lead was cut to 0, each one of the players wanted the ball, and wanted to finish what we had started. It is very difficult to lose a lead and maintain composure, but the Scotland Stars did just that. That is a credit to their character, and mental toughness. 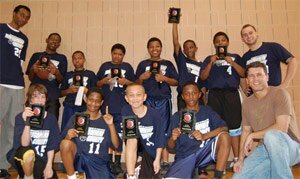 Alante, Jesse, Oumar, Matt, Jeremiah, Isaiah, Jalen, DaSean, Dijon, and Melvin were really the best group a coach could ever have. I think next season we need to add Super in front of our team name because these guys aren't just stars, they are SUPERSTARS!!!!! Congratulations and thank you to everyone who was involved. The best part of this team was everyone in the community was involved. We had the best team, and best fans each week. I am really sad to see the season end, but I know that our guys are going to be off to bigger and better things as they finish up their school year. I hope everyone continues to practice, play hard, and remember our 2010 season. I will cherish these 5 months for the rest of my life. This team made me a better coach, and a better person, and it was truly an honor to work with this incredible group of young men!!! I cannot wait for 2011!!!! Remember: Party is this Tuesday at 6:30 at Broadway. If anyone needs a ride there please let me know!!!! Thank you very much for this opportunity. I have had so much fun this year, and I really owe it to you and your amazing mother for allowing me to coach this group. I have coached a couple of teams in the past, but none has worked as hard as this one. Most of these guys had never played organized basketball, and I think that was evident in our first game. I thought we would go right around .500 after that, but then we made a miracle shot and started a run. I also wanted to thank you for giving these kids an opportunity. They were given a challenge and had to step out on a court in front of their families each week while living up to the expectations Brandon and I had for them. Character, Commitment, and Teamwork are the three keys to success in sports. If you accept a defeat with class and work to learn from your mistakes, then victory is right around the corner. That is what these guys learned. I kept telling them in that first loss that we were down 16 to 0 and then lost 30 to 15 which means we outscored them the rest of the way. I know out guys would beat that red team now if they had a rematch, but winning the title was more important. I hope with this championship all 10 of these guys realize with hard work comes success. Not everything is handed to you, but if you are able to struggle through some adversity and work had at improving yourself, then you can do anything you want. I tell my class each year on the last day of school they can do ANYTHING in life as long as they work hard at it. Some things, like making the NBA, take a lot more work than others. It is never bad to aim high, but you can't give up your dreams. First and foremost I want to thank EVERYONE who came out and supported us this weekend. We not only have the best team in our league, but we have the best fans as well. You all make the games fun and exciting, and both the coaches and players feed off that energy. Thank you parents and friends for your constant support with this team. Secondly, SIX IN A ROW?? SIX IN A ROW?? this streak is phenomenal to be a part of. The players on this team continue to grow as players, teammates, and people. I loved how we were in a line ready to shake hands at the sound of the whistle. Our opponents had to gather themselves for the line, but our guys knew the importance of congratulating them on a great effort. Awesome job guys! the thing I loved most yesterday was the trust the players had in one another. Everyone was looking for that extra pass to get a better shot, or to give a teammate an opportunity to score. Not only have has this team become the best team in the league, they are also the most improved. Dictionary.com defines team as a number of persons forming one of the sides in a game or contest. I think the Scotland Stars have one upped that and become a family on the court. I want to say to all of the players on the team you all played hard, you were determined, you were unselfish, you were terrific sports, and most importantly you were a family on the floor. Great job and GREAT GAME!!! I will see everyone Tuesday night for our final practice at 5. If anyone needs a ride please do not hesitate to email me. I am still speechless thinking about the finish to our game this afternoon. That was truly a fantastic finish. I have never been more proud of the effort, and teamwork that was displayed today on the basketball court. Every single player played an equally important role in that victory. This was truly a Scotland Stars team win!!!! Jesse came up with tons of rebounds, and a shot we will all remember for the rest of this season at the end of the game. Jalen played a fantastic point, and put up the tough shots when the team needed them most. Jeremiah brought a lot of energy into the game, and fought for every missed shot. Isaiah, like his brother played big. He made some great steals and really controlled the glass. Dijon put up some terrific shots from the outside that nearly fell, and pulled down big rebounds time and time again. Oumar played tremendous defense and saved a lot easy layups for our opponents just by chasing down the ball. Melvin who came late stepped up with a monumental rebound, and controlled the ball down the stretch. And Matt gave us the hustle and energy we needed from the start. He dove after EVERY pass and came up with numerous steals. I cannot express how proud Coach Ferrell and I are of the effort we witnessed today. We fell down early, and this TEAM battled back like champions do. This incredible group of young men are blossoming into such a fantastic team, and even better sports. I hope Alante and DaSean feel better as I am looking forward to a terrific practice on Tuesday. We will be back at Beverly Farms this week. I hope everyone enjoys the football that is on tonight and CONGRATULATIONS!!!!!! I know the score yesterday was not the outcome all of us had hoped, but I must say I was so proud of this team. Considering we have only had 3 real basketball practices, this team has come a very long way, and really come together. The team we played yesterday has been together for a couple of years, and they played a great game. The thing that impressed me the most was how our team handled the tough start to the game in the first quarter. They were very positive despite the score, and never gave up the rest of the game. Bringing an attitude like that each week is going to lead to our successes down the road. I am looking forward to practice tomorrow where we will implement some offensive plays, and continue to work on our defense. I am so proud to be a part of this team with such an amazing group of young men! Thanks for all who came to support yesterday!